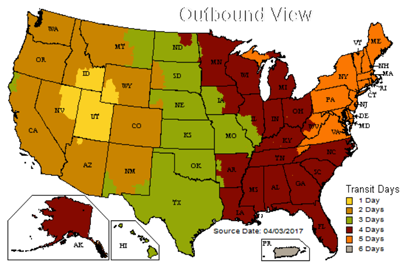 Image Armor is excited to announce that there is another distribution point for the Image Armor line of pretreatments in the western United States to help with next day and two-day shipping. 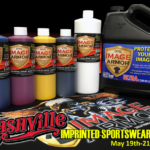 Regional Supply of Salt Lake City, Utah is Image Armor’s newest dealer and now carries the Image Armor line of pretreatments. More information or to purchase Image Armor products visit the Regional Supply website at www.regionalsupply.com or by calling 800-365-8920. If you are in the Salt Lake City area you can stop by their shop which is located at 4517 West 1730 South Salt Lake City, Utah 84104 Monday – Friday 8am – 5pm MST. Adding Regional Supply as a shipping point creates a next day delivery option for all of Utah, parts of north east Nevada, south east Idaho, south west Wyoming and second day shipping to most wester states west of, and including, Colorado (see map below). Call Regional Supply for more information on shipping options. 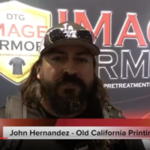 John Hernandez from Old California Printing stopped by our booth at the 2016 NBM Long Beach show and gave us a little history on his DTG experience and how the Image Armor inks and pretreatments helped his Direct to Garment business. Here’s a short testimonial video John shot for us at the show. The Nashville Imprinted Sportswear Show is coming up quickly and we wanted to invite you to the show! 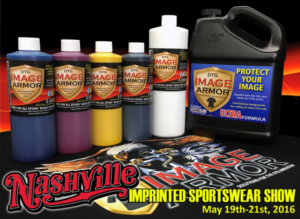 Visit the Nashville Convention Center May 19th – 21st and come and see why Image Armor is changing the industry. 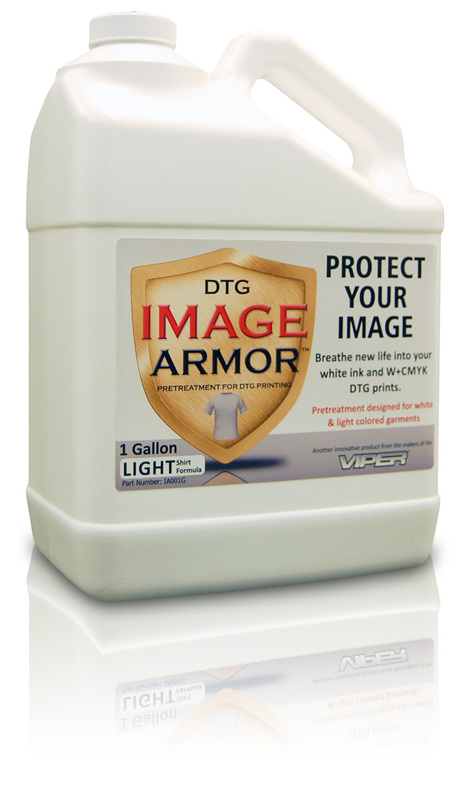 Find out how Image Armor can help your DTG business be more profitable this year. You can see the difference that our pretreatments make, how we can improve your quality of prints on white, light, and dark garments as well as how you can branch into doing other types of fabrics like polyester. 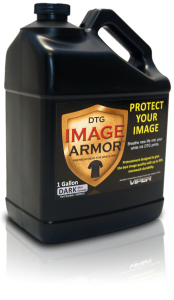 For new users who have never tried Image Armor pretreatments we will have samples we will be giving away. Who knows – we might even give away some of our industry changing E-SERIES inks while we are in Music City USA! Come and see us in booth #107 – we look forward to seeing you there! 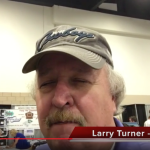 Larry Turner of Designs & More in Dumas, TX talks about his conversion experience with Image Armor Pretreatments, the ViperONE Electric pretreatment machine and more at the Ft. Worth ISS show. Play the video to learn why Larry loves Image Armor. Image Armor is proud to announce that we’ve finally gone to the Land Down Under. We are happy to introduce our newest distributor covering all of Australia, ASTech Solutions based in Sydney. Astech Solutions has been with DTG since it’s inception, providing installation and training services for DTG printers since the “birth” of DTG nearly a decade ago. Their technicians are factory trained and field experienced, having delivered scores of DTG installations, and trained hundreds of operators. 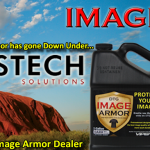 Now, ASTech Solutions will be providing the same expertise by expanding their product line with Image Armor Pretreatment Solutions bringing a whole new level of direct to garment pretreating to Australia. You can get more information on ASTech Solutions at their website at www.astechsolutions.com.au. 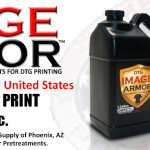 Image Armor, LLC is proud to announce that American Print Supply of Phoenix, Arizona is distributing the Image Armor line of Pretreatments for direct to garment printing. American Print Supply carries a complete line of screen printing supplies and specializes in DTG printer parts, inks, supplies and service. They cover the entire Southwestern United States bringing one day shipping of Image Armor to much of Arizona, Nevada, Southern California and Western Texas. Make sure to give them a call at 602-437-5231 or visit their website to order your Image Armor DTG Pretreatments. Tell them Image Armor sent you! IMAGE ARMOR LIGHT SHIRT FORMULAImage Armor LIGHT Shirt Formula pretreatment is designed for printing on White to mid-light colored 100% cotton fabrics. Our LIGHT pretreatment formula increases color vibrancy, washability, and detail. It is mainly used for CMYK (no white printing) or in conjunction with a white highlight or white under base to provide brighter colors on those harder to print colors where a DARK formula might scorch or discolor the garment.Image Armor LIGHT also provides an incredible sublimation like print on 100% white polyester, and white to mid-colored blends giving better wash and color vibrancy characteristics that normally were not easily achievable. 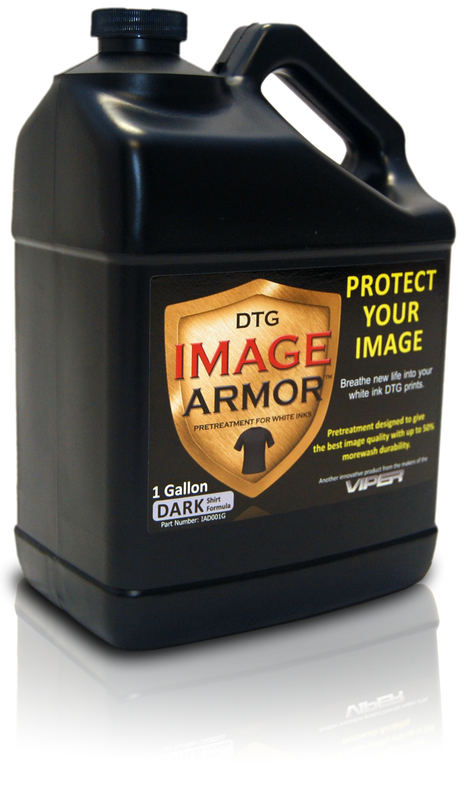 IMAGE ARMOR DARK SHIRT FORMULAImage Armor DARK Shirt Formula is designed for printing on mid-dark colors to black shirts consisting of 100% cotton. The DARK Shirt Formula increases washability and eases the application of pretreatments making it much more difficult to pretreat incorrectly. This “more forgiving” formula allows for those that apply pretreatment by hand to achieve better, more consistent results than previous brands of pretreatment. If you’re not sure, it is always OK to apply a little bit more without worrying if the image will wash out after the customer has taken their shirt home.